Most of us know how to put a password to open a file. But there are so many more features available to control confidentiality and privacy which are largely unknown and underutilized. Here is a comprehensive list – with short explanation for relevant items. I will cover these features in detail in my future blogs. File – Protect – Mark as final. Prevents inadvertent editing. No password required. Removes privacy related information like document properties, slide notes, hidden text, watermarks, comments, tracked changes. Use before publishing or sending files to outside your organization. You must obtain a signature from a providers like VeriSign, GlogalSign, etc. Most of the methods are easily available from File – Info menu. If it is a global tender or quotation and the requestor has asked for digital signature, you must obtain a signature from a provider and use Insert – Signature option in Office. If you want to protect parts of the document – keep some editable and keep some read-only – then choose Review – Restrict editing dialog. Now the entire document is read-only. 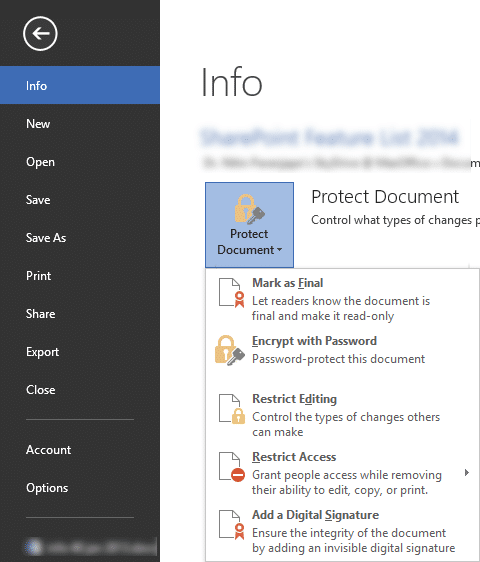 Select the are in the document where you want to allow editing and click on Everyone. Repeat for more editable areas. The No changes dropdown also shows other interesting options like Comments Only and Track Changes only. Use More users to add person specific exceptions. This way, specific person(s) can edit specific areas of the document. Similar feature is available in Excel – Review – Allow users to edit ranges. If you want to protect documents on the hard disk of your PC or USB drive, you must use BitLocker Windows 7 / Windows 8 functionality of Windows. With IRM you can also use Protect in-Place functionality.